Jane: What made you want to do a musical? Jonathan: I’ve always been a big fan of musicals. It felt like a natural progression from writing straight plays. Chris: Jonathan’s always used music in his plays, sometimes Pet Shop Boys music… It was a natural thing for us to want to do, because like in Spinal Tap it’s one of those things rock groups always promise themselves. When you’ve been making records for 18 years, it’s something fresh and exciting. Also we found that when we’ve done our own shows we’ve worked with people in the theatre and we like the way they work, the intellectualism you get, the way the costume designers and choreography all come together, it’s totally different from the music industry. Mikey: Did Jonathan approach the PSB about doing a musical, or was it the other way around? Jonathan: The Pet Shop Boys approached me. The BBC wanted to do a television musical and suggested me as writer. Chris: We particularly liked Jonathan’s play Beautiful Thing. Phil: Jonathan – have you written any plays before? Jonathan: 13 plays, one film and a bit of TV. Mikey: I heard that Closer To Heaven took about six years to get to stage after inception. Why did it take so long, and are you planning to do another musical? Jonathan: It took six years because we spoke about it one day and had the first meeting a year after. For the first few years we only worked on it a few weeks a year, because we were working on other things. Chris: The whole process is a lot more complicated than making a record. With a musical you’re writing it, but you haven’t got any kind of deal. You have to get people interested in it and making it work from the initial stages – you don’t know how it’s going to work. It’s a real learning process. It was only last year when we did a workshop that we realised how much work needed doing on the piece. Having said that, the time seems to have flown by. But we’ve also been touring, putting out an album and Jonathan’s been doing other work – two series of a sitcom. Joemoz: Have any tracks from the musical been marked as singles yet? My Night? Chris: Yes. We’re thinking of releasing Positive Role Model, sung by Paul Keating. 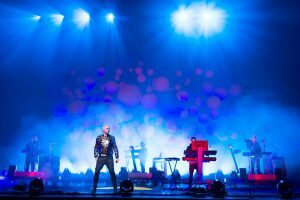 None of the songs in the musical will be released as singles performed by the Pet Shop Boys, but produced by the Pet Shop Boys and Stephen Hague. Toni: Jonathan – do people always remember you for Beautiful Thing? Do you want to write something that will replace that as your main claim to fame? Jonathan: People do remember me for Beautiful Thing, but that doesn’t bother me. Toni: Pet Shop Boys, do you get pangs of nostalgia for Eighties music when you were on Top Of The Pops with all the other Eighties artists? Chris: No, I don’t really like living in the past. I’m not really into retro stuff. I think the most exciting time is always the present. Having said that I think the Eighties were fantastic, it wasn’t the decade style forgot. 1988-89 was my favourite time ever. It was fun, aspirational – it was when the Nineties began, all the house music. Rachel25: What do you think about the Mamma Mia musical, have you seen it? Jonathan: I really, really like Mamma Mia, though I didn’t like the audience. They talked through all the speaking and joined in with all the songs. Chris: I like Abba’s songs, but I never need to hear them again. I thought the show was ghastly (laughs) and nothing like Closer To Heaven. Prm2001: What are your favourite songs from Closer To Heaven? Chris: I think I like For All Of Us. It’s a sad weepy song at the end of the musical. Jonathan: I think my favourite is Friendly Fire, sung by Frances Barber. Chris: She sings it fantastically well. Joemoz: I loved the musicaI but I have to say that I think ‘Caligula’ is somewhat misplaced in the musical, and does not bring the storyline forward – do you agree, and are you considering changing it? Jonathan: We have already changed Caligula, we agreed with you. It is now one of the strongest scenes in the show. Joemoz: Have you made, or are you planning any substantial changes to the musical, as compared to the first preview? Jonathan There’s lots of small changes each night. Chris Dahl: What do you think about Berlin/Germany – did you enjoy the nightlife? Do you have a favourite club? Chris: Me and Neil really like going to Germany. We’ve been working with a producer called Chris Zippel in Berlin. I love your sausages. Sophie: Any chance to see the musical in another country, in Europe or the USA? Chris: With any luck. We have investors from Germany, Mexico, New York. It’d be nice if it could open in other cities around the world. It’s not a spectacular like Cats, or Phantom Of The Opera. It’s a play with music, a smaller scale production. Prm2001: Why is Closer To Heaven in such a small theatre? I think PSB likes it bombastic. Chris: It’s our first musical. We didn’t want hype or a really big event. We want people to discover it. We’re testing the water to see how it’s received. Andrew Lloyd Webber and Tim Rice wrote Jospeh for a school production I think. It’s all part of the learning process. When we made our first record it was released only on 12′ imports from New York, so it wasn’t exactly bombastic. Knobster: I know it’s probably been asked 100 times but why the name ‘Pet Shop Boys’? Jonathan: Because they both come from pet shop owning families. Chris: Neil has a chain of pet shops in the north east of England – Tennant’s Terriers. Pikachu: I remember the Pet Shop Boys when I was in my early teens, and you have been going for a number of years now – when do you plan to retire and what are your hobbies? Rondicko: Since you’ve always disassociated yourselves from Eighties things, why are you touring the US with Soft Cell? Chris: They’re just one act on one of the most varied broad and exciting touring bills ever to travel across America. Also we really like Soft Cell and David Ball went to my school. Paninari: We fans hope Closer To Heaven will be released as video, do you know something about that? Chris: There are no plans to film Closer To Heaven and release it as a video. I think that plays and opera etc don’t really work on film, but I’d hope that one day soon it will be made into a film. I think it’d make a very good film. Dez: Andrew Lloyd Weber – what is his part in this musical? Jonathan: His company are producing the musical, but he has no creative input whatsoever. Roxy: Do you enjoy doing interviews over the Net or prefer face to face? Chris: I think I prefer over the Net. You don’t have to shave. Sophie: Why doesn’t Neil sing in the musical? Why aren’t you really on stage? Chris: Neither Neil, me or Jonathan are performing in the musical. We are the writers and as anyone who has seen It Couldn’t Happen Here will know, me and Neil are not the best actors in the world. Roxy: Was your childhood dream to become famous? If not, what was it? Chris: No, I had never wanted to become famous and do not regard myself as famous. I dislike the whole concept of fame and people such as boy-band members who only seek fame – they are shameless. There’s a song about it in the show. Neutron: Jonathan, will you give Neil and Chris a part in the new series of Gimme Gimme Gimme? Jonathan: No, I wish it to be a success! Chris: As if we would agree to appear in Gimme, Gimme, Gimme! Edge2life: Do you really have an album ready just in case you die called Posthumously? Chris: There are a lot of unreleased tracks lying around in demo form and I’m sure that they may get released if we both died in a plane crash or something but the repackaged albums contain some previously unreleased mixes and new things. Morecambe: Boy Are there plans to release the album from the show? I saw the show last week and thoroughly enjoyed it. Good luck with it. Chris: Yes there will be a cast album due in the autumn. Neutron: Does writing songs for the new album feel very different from writing for Closer To Heaven? Chris: Yes. The new album is very different in style to the music in Closer To Heaven. It’s quite a different direction, but we’re using guitars, real drum samples and it’s not so much dance music, but the songs are very heartfelt and emotional and quite sad, but with very strong melodies, but it’s beautiful. Chris Berlin: Where does the music come from? Is there an orchestra, or is it from tape? Or even live with synthies? Chris: In the show the music is generated by computer with samplers and electronic keyboards and there’s also a live percussionist, there are no tapes. Guest80: Chris, I thought you thought guitars were dirty. Chris: Yes, I must be getting dirtier in my old age, but I can’t play the guitar, it’s Neil. Clairepsb: Are you going on holiday this year? Jonathan: I’m going to Morocco in August and Mauritius in December. Chris: I’m going to Ibiza. I’ve never been but I’ve heard it’s very good. Virgin.net: Thanks everyone for joining this chat with Jonathan Harvey and Chris Lowe. Jonathan: Go and see the show! Chris: Thanks everyone for the questions, hope the answers were informative – not everything said is true. Hope to see you all soon. By the way, the musical is rather good! Keep sending your photos to the Pet Shop Boys website, because I like seeing what you all look like.